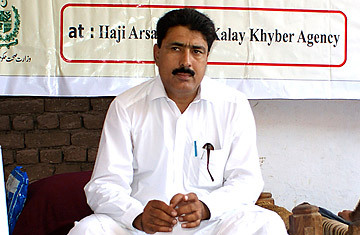 This photograph taken on July 22, 2010, shows Pakistani surgeon Shakeel Afridi, who was working for CIA to help find Osama bin Laden, attending a Malaria control campaign in Khyber tribal district. Pakistan's problematic relationship with the United States sailed into fresh controversy as US lawmakers warned of aid cuts after the jailing of a surgeon who helped the CIA hunt down Osama bin Laden. Two years ago, Shakeel Afridi was a government surgeon at a hospital in Pakistan's semiautonomous tribal belt and commanded a small army of caregivers. Today he stands stripped of his job and his freedom, and is poised to become the latest flashpoint between the U.S. and Pakistan, tenuous allies at best. Afridi, 48, was arrested in Khyber district just weeks after U.S. Navy SEALs found and killed Osama bin Laden in the Pakistani garrison city of Abbottabad last year in May  an operation that Afridi assisted by running an unauthorized hepatitis-B vaccination campaign to trace bin Laden through DNA samples of his children. Soon after, Pakistani court documents state, Afridi was "handed over to an intelligence agency," presumably the Inter-Services Intelligence Directorate (I.S.I.). In October, he was presented before the high-powered Abbottabad Commission, which includes a Supreme Court justice and a retired Army general, which had also recommended a treason trial for him. Within a week of that appearance, Afridi's worldly possessions were confiscated and he was sacked from his government job, along with others who had reportedly helped him. He was in custody for almost a year until a local court took up his case last month. On May 24, that court  comprised of tribal elders and a government-appointed administrator  issued a five-page verdict finding Afridi guilty of having "close links" with the militant organization Lashkar-e-Islam (Army of Islam) and its leader, former truck driver Mangal Bagh. It states that Afridi helped militants in their fight against Pakistani troops by providing them free medical care and donating Rs. 2 million ($21,000) in 2008. He has been sentenced to 33-years in prison. The tribal court also notes that there was evidence of Afridi acting with "foreign intelligence agencies" but that it lacked jurisdiction to try him on that score. It recommends Afridi be tried for treason, an offense punishable by death, for aiding U.S. efforts to locate bin Laden. "For now, we will only deal with the allegations that he was working with militant organizations," says Ijaz Mohamand, president of the FATA Lawyers Forum and one of the men working on Afridi's appeal. For its part, The Lashkar has denied any connection with Afridi. "We have no link to him, this has been concocted by the government," said a Lashkar spokesman. "If we can, we will even kill him inside the jail." The Lashkar said the sum paid by Afridi was a fine for him overcharging patients and performing unnecessary surgeries, it was not aid. Meanwhile, there is concern about Afridi's safety. In a phone interview with TIME, Mohammand of the lawyers forum explains that Afridi is being kept in complete isolation and has yet to speak to anyone  including his legal counsel or family. "We actually have no idea where he is. He could be in jail; he could be in a foreign country; he could be anywhere." It is most likely, however, that Afridi is being held in Peshawar's central jail. "We have requested the federal government to move Dr. Shakeel Afridi from Peshawar to another jail. We fear he could be attacked," Mian Iftikhar Hussain, information minister for the Khyber-Pakhtunkhwa province, told journalists on May 30. The Peshawar jail has more than 250 prisoners incarcerated on terror charges. According to Hussain, these "diehard militants" could attack Afridi. Shaukat Qadir, a retired brigadier and columnist who has been provided unrivaled access to the Army's Abbottabad files, agrees that the government would be unable to secure Afridi for very long: "There are enough al-Qaeda sympathizers in Pakistan that he will never be safe here." Having seen some of Afridi's interrogation documents, he told TIME that the doctor was "definitely" working for the CIA, even if he didn't know that he was spying on bin Laden. "He asked them for money, $10,000," he says. "When things heated up, he even tried to contact the CIA station chief in Pakistan. No one would take his calls." Indeed, some voices in both Pakistan and the West have blamed the U.S. for not doing enough to protect Afridi. Lawyer Mohamand agrees with Qadir's assessment. It will be "very difficult" for his client to survive in Pakistan even if he is exonerated, he says. Says Qadir: "If he is ever freed, the only things waiting for him are either a deep grave or deep exile." Afridi's travails have not gone unnoticed by the Obama administration. On May 25, Secretary of State Hillary Clinton said his "help was instrumental in taking down one of the world's most notorious murderers." The U.S., she said, "regretted" his conviction and sentencing. Earlier in January, Defense Secretary Leon Panetta defended Afridi on CBS's 60 Minutes: "He was not in any way treasonous toward Pakistan." Meanwhile, the U.S. Senate Appropriations Committee recently voted to cut $33 million from the $800 million annual aid budget for Pakistan  $1 million for each year of Afridi's sentence  and Sen. Rand Paul has demanded all aid to Pakistan be stopped and that Afridi and his family be granted U.S. citizenship for his efforts in pinpointing the location of Osama bin Laden. The law allows Afridi to appeal his conviction and sentencing  a course his lawyers have pledged to take, all the way to the Supreme Court if necessary. But given anti-American sentiment in Pakistan, there seems to be little or no sympathy for Afridi, even if he was instrumental in getting bin Laden  or perhaps because of it. "Of course it was treason," says Qadir, the retired brigadier. "No country, including the U.S., would permit their citizens to act as spies for a foreign power  friendly or otherwise." Says Abdullah Gul, a member of the far-right Defense of Pakistan coalition: "This is an internal matter and no one else should be expected, or allowed, to interfere. [Afridi] should be treated in accordance with the law." Aslam is deputy editor of Newsweek's Pakistan edition.